We are delighted to introduce BRFCS brand new columnist Red Rose Rover who will be doing regular blogs and opinion pieces. Over recent years, the concept of a football club participating actively in its local community has become routine. It is no longer a differentiator of a big club; it is quite simply an expected function. Clubs are affiliated to their community trusts, who in turn use the power innate in the partnership to organise initiatives and events that mutually benefit the local causes. Even the Charity Shield was renamed to the Community Shield reflecting the prevailing mood. However, it is the community spirit that can be found amongst football supporters within football grounds that never ceases to amaze me. At various times over recent years when I have questioned my sanity in returning to Ewood Park every season, my motivation for attending has slowly, surreptitiously yet significantly changed. On the field diminished, in the stands highlighted. As the results worsened, the social interaction became the main reason for returning; an overwhelming sense of not wanting to let anyone down. Season ticket holders, who occupy the same seat, season after season, typically find themselves surrounded by familiar faces. Pre-match, half-time and post-match conversations lead to shared opinions, discussions, debates and fortnightly updates on events ranging from international geo-political turmoil, dropping all the way down to family news such as christenings and weddings. Some of those stadium neighbours transition from being merely fortnightly acquaintances to firm friends. Like any neighbourhood, you don’t get on with everyone, but some personalities resonate more strongly than others. Some make you laugh. Some challenge your established world view. Some just have the happy knack of making you feel better for the encounter. At the beginning of every season you look around and see who has renewed. There are little nods, smiles and waves of acknowledgement. The gang is reassembling. Just occasionally, a seat is unfilled and remains so for a couple of games. You hope it’s just a late, poorly timed holiday, but then eventually word filters through of a recent funeral and everyone in the vicinity shares the loss. A good few years ago now, it was those people around my chosen seat that helped to keep me going whilst I was undergoing a course of treatment for a serious illness. I missed a batch of home games and when I returned, the polite enquiries as to my health were every bit as genuine as those I received from close family. In fact I joked on more than one occasion that the poor chap who sat next to me knew more about my life than my own mother. 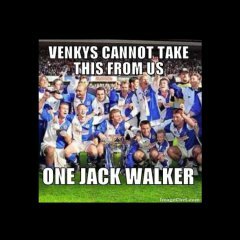 But then Venky’s arrived and after the divisive and poisonous Steve Kean reign, my little group started to fragment; one or two at first drifting away but eventually resulting in that community withering on the vine. I missed the rituals. Arrive in the seat at 2:30pm to allow plenty of time to catch up. I wonder whether some of those long absent neighbours are still with us and please God they are, whether they miss it or not after so long away. However, I see a few signs of the spirit that I have missed for seven or eight years slowly starting to return. Performances on the field make a big difference. Watching a winning side is naturally a lot easier. But in my experience, it may also be in part due to the increased power and reach of social media. Over the last two or three years, thanks largely to Twitter, I have enjoyed sharing the experiences of a cluster of Rovers fans internationally and in turn having my whimsy indulged by them. It fostered a virtual community that has in some instances led to the creation of a real-life community. I have been cajoled in to attending away matches again. I meet up with interesting, enthusiastic people who all seem to be doing interesting and in some instances, extraordinary things with their lives; tremendous physical challenges raising astonishing sums of money for great causes. I’ve moved on, but membership of this virtual community has helped to make watching football an enjoyable experience again. Football does a great deal of positive work in the community, but the community spirit engendered within a football ground by football supporters can in my experience be a powerful change agent for good, in us all. A lovely read and a reminder to all of what a football club means to a community. Unfortunately it reminds me again of the wanton destruction of what we hold dear committed by those people far away in cohorts with the nameless ones.